Nokia is eschewing the curves which they arguably brought to mobile phones in the first place and going all angular. The Nokia Prism was unveiled at a fashion show in China. Yes, a fashion show, not a technology conference as might be expected. To be honest, the technology under the surface of this handset really isn't anything to write home (or a blog entry) about: Bluetooth, USB 2.0 (I like), EDGE, GPRS and Tri-Band. But the design is rather original, no? I love it when visions of the future from decades gone by actually come to be realised, rather like this lovely slab. Every pair of jeans that I own has a white line around the lefthand pocket where my phone has sat. It makes me all nostalgic, looking at an old pair of 501s which no longer do up to see the outline of my first ever mobile - a Siemens S8 - which this page informs us has such groundbreaking features as a "large 4 line display" and "99 name phonebook". 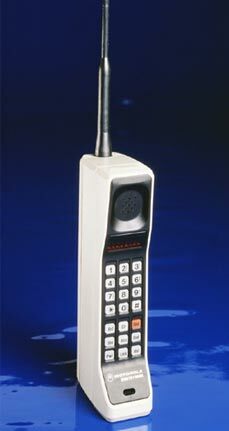 Look at those sharp edges on the new Nokia! A recipe for denim disaster, no? That phone is hot. I don't know if it's the sort of phone I would want on a full-time basis, but damn it's nice to look at. Swing past my mobile phone industry blog. For me its too radical. They look ultra modern and then in 6 months lokk ultra out of date. The phones that develop gradually getting slightly smaller, better finish etc are in my opinion the phones that will be around the longest. I think it's cool but how long will the look last? I have a Motorola Car phone with an antenna sticking up from my trunk and this gets attention because everyone thinks car phones are gone, yet I have found it in other websites like this one now. Is this the best looking phone ever?